Always end with some good stats I say, and I think we've done that. Returning to more pertinent matters, it was a very good day for Lewis Hamilton as he claimed his 41st career pole position with an impressive performance at the wheel of the Mercedes. The double world champion topped every practice session in Shanghai on his way to pole, with team-mate Nico Rosberg trailing unhappily in his wake. The gap to the Ferraris also looks ominous, but should tyre management come into play in a significant way tomorrow, then the scarlet cars could threaten Hamilton's dominance. We'll be back with you from 05:30 BST to see what transpires. Ayrton Senna, when not being eyeballed at close quarters by Alan Pardew's old man (see 09:42), was a demon at the old pole postion game. He got 65 of them in 162 races, a strike rate of 40.37%. Michael Schumacher's record of 68 was achieved in 308 outings, a 22.15% success record. Senna's poles were rather more spread around the circuits of the world - 20 to be precise - but he scored five at both Monza and Monaco, six in Adelaide and eight at Imola, the track that claimed his life in 1994. He was on pole for that fateful race, of course. Juan Manuel Fangio gives good stat. He raced in just 51 grands prix (admittedly at a time when there were far fewer races in a season), but won 24 of those (47.06%), claiming 29 pole positions (56.86%), 23 fastest laps (45.10%) and 35 podiums (68.63%). All of that combined made him a five-time world champion. By comparison his return of five poles at just one venue seems modest - yet it's enough to earn him a place among this small but happy band of record-holders. His five poles came at Monza, while he also managed four at Spa-Francorchamps, Reims and Monaco. We told you earlier that Lewis Hamilton is now in an elite group of four men who can claim to have taken pole position at least five times at one particular F1 track. In the case of one of those men, Michael Schumacher, the feat was achieved at no fewer than six tracks. The seven-time world champion took five poles at both Imola and Sepang, six at Montreal, seven at Barcelona and the Hungaroring, and a mildly staggering eight at Suzuka. Mercedes on Twitter: Chatting through a Shanghai stunner with David Coulthard & Suzi Perry for @bbcf1: what a lap it was from Lewis Hamilton! Today's result marks Lewis Hamilton's fifth pole in China, which means he joins Ayrton Senna, Michael Schumacher and Juan Manuel Fangio in the only drivers to score five or more poles at one particular track. Special mention to our social media guru Joel Goldman who sent me this picture of Ayrton Senna along with the caption: "Alan Pardew's dad, furthest right." Sebastian Vettel, who starts in third, said: "Happy with today - it was a different strategy for us today in Q3, going only once on used set. Mercedes were quicker than expected - P3 was the maximum we could have expected today. "Hopefully tomorrow will be closer - we're looking forward to going racing - it's not far to turn one. And it's a track where tyres are important." Asked whether he was frustrated at not taking pole, Nico Rosberg said: "Definitely, yeah. When it's four hundredths... that's nothing. I'm frustrated because it's so close." Lewis Hamilton is understandably a satisfied man after that performance, but the memory of Ferrari's win in Malaysia is still very much on his mind. "China is continuing to be generally a good circuit for me," he said. "The car is handling fantastically well this weekend, a lot better compared to how it was in Malaysia." Asked what lessons had been learned after Sepang, the Mercedes driver said: "There's too many to mention but obviously it wasn't the tidiest weekend for us. "For us on my side of the garage, we've tried to get our full programme in, we've not had any problems this weekend. We've still a tough race ahead because the Ferraris are good on long-run pace, so it's not over by any means." Luper Daniel: #ChineseGP The Prancing Horse of Vettel simply won't go away. Seems we fixing for another good fight tomorrow. Wycliffe Alwal: That McLaren who were championship contenders just a few years ago are only faster than Marussia in China qualifying is worrying. Note the gap of nine tenths of a second between the quickest Mercedes and quickest Ferrari. Although Lewis Hamilton looked mighty today, it's worth noting that he was unable to improve on his final lap, allowing team-mate Nico Rosberg to close to within 0.04secs on his last flyer. "Oh come on, guys," was Rosberg's response when told of the gap over the team radio. Still, it was enough for the reigning champion to earn his 41st career pole position. That walloping lap from Lewis Hamilton has unsurprisingly secured pole for the Mercedes man. Team-mate Nico Rosberg will start second ahead of Ferrari's Sebastian Vettel. ... and the battle looks very much to be over for pole. Who will be third? Felipe Massa's Williams is the present incumbent but those Ferraris are sniffing around. You can pretty much stick a fork in this qualifying session. Lewis Hamilton has just done a 1:35.782. A thumping, trouser-trembling time. Team-mate Nico Rosberg, as he seems to have done for much of the weekend, trails by three tenths. Q3 is off and running. How fast can you go, Lewis? Jeremiah Kariuki: Saubers have as well improved and their rookie driver proving he can be a champion in the making. Gareth Jones: Ron Dennis: "Eric, get on the phone to Manor - let's use *their* cars next race"
Simon Latson: Whilst I want them to do well, McLaren have produced more lemons in recent years than the man from Del Monte. Prove me wrong why don't you? Wow, I did not see that coming from Sauber. Having declared them dead and buried in my last post they are BOTH through to the top-10 shoot out. Out instead goes Pastor Maldonado of Lotus in P11, Daniil Kvyat of Red Bull in 12th, the Toro Rossos of Max Verstapoen and Carlos Sainz in 13th and 14th and the Force India of Sergio Perez in 15th. Who's going to miss out on top 10? Just seconds remain in Q2 and you have to say it looks like Sauber are struggling. Who will join them in elimination? The Ferraris have posted their times for Q2 and they are good. Sebastian Vettel does a 1:36.9 - just two tenths off Nico Rosberg. Kimi Raikkoen is not all that far behind in fourth. Still no Ferraris on track in Q2. The scarlet cars were quickest in Q1 and should be on the board soon. OK, Q2 has just got serious with Lewis Hamilton strapping on the soft tyres and banging in a 1:36.423. The quickest time of the weekend by some way. Team-mate Nico Rosberg is three tenths back. "The car didn't feel bad so it's interesting when you find a good balance but the lap time is not there," McLaren's Jenson Button tells BBC Radio 5 live. "We've made good improvements this weekend but qualifying just wasn't for us. I'm relatively happy with the balance. "Hopefully we'll be racing the cars in front tomorrow, but we hoped to be competing with them in qualifying as well." Clint Bubba O'Neil: Growing pains for McLaren-Honda? Once again, Alonso and Button fail to qualify for Q2??!!! Brutal! A reply has shown Fernando Alonso had a very twitchy moment on his final qualifying lap. It cost him a couple of tenths - more a less the amount he missed out on the top 15. An unwanted hat-trick for McLaren - both cars are out in Q1 again, as they were in Australia and Malaysia. This continues the team's worst run of qualifying form since the current system was adopted in 2006. The Force India of Nico Hulkenberg joins the McLarens of Jenson Button and Fernando Alonso in being eliminated, along with the Manors of Will Stevens and Roberto Merhi. Who's in the danger zone? With two minutes left, our Q1 drop outs are the Manors of Will Stevens and Roberto Merhi, the Lotuses of Romain Grosjean and Pastor Maldonado and the Toro Rosso of Carlos Sainz. No nonsense from the Williams boys. The team have bolted on the soft tyres to be absolutely sure of getting through to Q2. Seems overly cautious but I guess you can never be too careful. Valtteri Bottas is currently second with Felipe Massa fourth. Jenson Button: "The rears are overheating towards the end of the lap." Button is currently in eighth, 1.6secs off the pace. Team-mate Alonso has dropped to 10th. Fernando Alonso is on the board with a 1:40.327 on the soft tyre. He's eighth right now. Remember, the McLarens need 15th or better to make it through to Q2 for the first time in 2015. Red Bull Racing on Twitter: Getting set for quali. Daniel Ricciardo gets in the zone, ready to take it to the track! Lilliana Lulli: Hoping #Ferrari can at least split those #Mercedes' Put on softs and GO GO GO boys!! "The focus in the first part of qualifying will be on McLaren-Honda, who for the first time this season have the hope of getting through it into Q2. But if one of their drivers is to manage it, you would have to say it would be more likely to be Jenson Button. "Fernando Alonso, for all his ability, is on the back foot, having missed all of final practice because of an engine problem. The car is ready to go after the team fixed what they say was an ignition system problem. But Alonso, with no running today, will have his work cut out." McLaren's Fernando Alonso is straight on track so that problem from FP3 has been cured. Good to see. Sauber have tweeted a picture of the handsome C34's steering wheel. Suzi Perry, Tom Clarkson, Jennie Gow & Jack Nicholls will be your team for qualifying highlights at 13:00 BST on BBC One. That's our line-up, but how will they be lining up on the grid? The Daily Telegraph has a nice story in which Sebastian Vettel reveals he would have loved to have spoken to Ferrari legend Michael Schumacher - currently recovering from a serious head injury - before moving from Red Bull to the Scuderia. The Daily Mail says Nico Rosberg has been told by Mercedes advisor Niki Lauda to up his game in the title battle with Lewis Hamilton. Nico Rosberg on Twitter: Thanks so much for your support here in China!!! We have a great deal of The Sport for you this weekend, as you might be aware. Here's a selection of what's to come today. There's the small matter of the Premier League too, don't forget. 'Mon the Tigers. I'll be honest, athletics is not my strong suit so I'll just wrap up this entry up now. Kayleigh Gray: Going for Vet, Ham, Ros. And Button into Q2. Keep your qualifying predictions coming in via #bbcf1. ... that Ayrton Senna produced one of the most memorable opening laps of all time in the wet at Donington Park. The McLaren driver famously went from fifth to first in one lap, dispatching the Benetton of Michael Schumacher and then the Sauber of Karl Wendlinger in the opening turns, before making short work of Williams duo Alain Prost and Damon Hill. What a great season 1993 was. Indeed it was enough to get a certain BBC live text goon hooked on the sport for life. Jeremiah Kariuki: Pretty shameful that Alonso is having to experience all these problems with McLaren. Not even setting a lap time in FP3! Ipkw: Looking good for qualifying! All the best Lewis! Jash Nyash: Looking forward to the race. It surely will be one hell of a cracker with tyre wear & strategy in the mix; the show is on! £3,500 or thereabouts will get you a three-day Paddock Club ticket in Shanghai, where the catering's good, the views are better and the bonsai trees grow particularly wonkily. Will we get a full house in Q1? We are yet to get all 20 cars out in Q1 in 2015, a stat that could roll over today if the tech trouble at McLaren is truly serious. The main culprits this year have been Manor, who did not get out at all in Australia as their Windows 7 wasn't compatible (or something) while in Malaysia the car of Will Stevens didn't hit the track in qualifying due to a fuel system issue. Both Stevens and team-mate Roberto Merhi have run OK so far in Shanghai, with the Briton posting a time well inside 107% Lewis Hamilton's benchmark in FP3. No McLaren has progressed from the first part of qualifying this year and their prospects of doing so today took a hit with an engine failure for Fernando Alonso early in final practice. The team have been working hard to fix the problem but even if Alonso gets out, will the lost time in FP3 be too damaging? Posting the 10th and 12th quickest times on Friday will give hope to Alonso and team-mate Jenson Button, but that will count for nothing if they bow out in Q1 yet again. Ok, 60 minutes 'til this Chinese Grand Prix malarkey gets down to some real business. Who'll be the winners and losers? You'll find out here. Ok, the live text commentary boffins are going to take five (well, more like 50). We'll be back with you at 07:00 BST for the build-up to the qualifying hour, where Lewis Hamilton looks every inch the man to beat. Read Andrew Benson's final practice report. So, a quick look at the top five at the end of final practice. Former Cosworth boss Mark Gallagher tells BBC Sport: "If Red Bull bothered to go up the road, they'd find a company capable of making a competitive engine." For the record, Cosworth are based in Northampton... 20 miles up the road from Red Bull's Milton Keynes headquarters. Another blow for Red Bull-Renault relations. Daniil Kvyat reports a loss of power and trundles back to the pits. Farid Kipirash: Alonso's patience ran out at the worst possible time. Now Vettel looks pretty good in that red car. "Lewis Hamilton has always loved the Shanghai track. Its unique demands make the front tyres the most heavily worked, which in turns means it is necessary to set the car up to protect them, and therefore with a slightly oversteery balance - which, as it happens, is how he likes to drive. "It was no surprise, then, that Hamilton looked fantastic on track in his Mercedes in China on Friday, and appeared streets ahead not only of every other team, but also his own team-mate Nico Rosberg. "There was even a hint of his cast-iron confidence that he is the better driver at Mercedes when he said: 'It is quite close between us and Ferrari and Nico is quite quick as well.' On a track on which he has won more times than anyone else, few would bet against Hamilton maintaining that form." Manor F1 on Twitter: Roberto's 'lucky egg' equivalent - getting in the cockpit from the left. The soft tyres are going on the cars now and the times are coming down accordingly. Red Bull's Daniil Kvyat was first to change to the yellow-walled soft and briefly went quickest, but the Mercedes followed suit and restored the order at the summit. Nico Rosberg vaulted to the top of the order with a 1:37.841, but team-mate Lewis Hamilton has just lowered the mark again with a lap two tenths quicker. "As Fernando Alonso sits in the McLaren garage watching the mechanics trying to work out what made his engine stop after two corners of his out lap, it's hard to avoid an uncomfortable thought about Honda's return to F1. "They clearly were not ready to race at the start of this season. So you have to ask a couple of awkward questions: 1) why did they not delay their debut by a year, given that they only started working on the engine in 2013, and did they underestimate the task? 2) Why on earth did they not stick the engine in the back of a Formula Nippon car (or even a three-year-old F1 car) and pound round and round Suzuka, which Honda owns, until it was sorted?" "Friday was a much better day for Red Bull, who have endured a sobering start to the season. A poor first race, and an even worse second one have led to team owner Dietrich Mateschitz to threaten (again) to quit F1 if Renault cannot produce a competitive engine. "It's not all Renault's fault, though. Chief engineer Paul Monaghan admitted on Friday that the Red Bull car "probably lacks a bit of downforce". Which must be the first time that could be said for six years. Quite why is not completely clear - Adrian Newey was still very heavily involved in the 2015 car despite the much-vaunted 'stepping back' into an advisory role. "Anyway, Daniel Ricciardo set a decent-looking one-lap pace, and was right with the Ferraris on the long runs, too. A challenge for the podium looks on the cards." Brake problems for Daniel Ricciardo it seems. His car has just been wheeled back into the Red Bull garage with smoke pouring from his rear tyres, the BBC's Tom Clarkson reports. The Australian is currently sitting in ninth place, 1.343secs off the quickest time. Lewis Hamilton has been on the radio to complain about his seat getting over-heated. Hamilton's seat was pictured earlier in the week with a gold heat-reflective panel on one side, to protect the driver from heat coming from the car's Ers system. We've just seen Hamilton's spare seat being put into his car. Handily, the BBC's very own Tom Clarkson snapped a picture of that very same spare seat yesterday. Whatever the problem was with Jenson Button's McLaren, it seems to be fixed now. The Briton has got back out on the track and has pumped in a time just a shade under two seconds off the benchmark set by Lewis Hamilton, good for ninth. Here's a stat for you, stat fans. The driver topping FP3 only took pole seven times in 19 rounds in 2014. So, whatever happens over the remaining 35 minutes or so is not necessarily going to be a guide to qualifying later today. Keep your comments coming on this or any F1 topic. We'll publish as many as we can. Writing before McLaren's FP3 trouble, Andrew Benson had this to say about the team's current situation. "McLaren have too illustrious a history to get very excited about 10th and 12th fastest times in free practice - especially when the drivers in question are as good as Jenson Button and Fernando Alonso. Nonetheless, this marked another huge step forward for the team this season; they have gone from five seconds off the pace - and 1.5secs slower than any other running car - in Australia to 'just' two in China, just two races later. And the drivers now have realistic hopes of getting into second qualifying. "Button, meanwhile, said the car was 'a pleasure to drive'. And the midfield teams such as Lotus and Sauber are already looking around nervously at McLaren in the expectation that their days in front of their grandee rivals are running out." Fernando Alonso's team-mate Jenson Button also has problems. He is informed on the team radio that "the issue is not fixed, so be careful". Troubling times down at McLaren, who looked OK on Friday with the cars finishing 10th and 12th. Bad start for McLaren-Honda and Fernando Alonso. The Spaniard's car made it through just two corners before grinding to a halt with an engine problem. No red flag; covered off with yellows. Third practice for the Chinese Grand Prix is under way. Sepang winner Sebastian Vettel is straight out on track in the Ferrari. Toro Rosso on Twitter: Car is looking good isn't it Carlos!? Yep, go on, in you get, it's #FP3 time!! 10 mins to green light, ni hao!! Mercedes' Lewis Hamilton was in a league of his own throughout Friday practice. Lewis Hamilton on Twitter: My amazing fans that came to see me this morning, all wearing my caps! "Ferrari won in Malaysia thanks largely to their ability to preserve their tyres better than Mercedes, allied to a pace good enough to enable them to translate that into a race-long challenge. And there were hints on Friday that this may become a running theme this season. "While Lewis Hamilton was on average 0.7secs a lap quicker than Kimi Raikkonen on their soft-tyres race simulation runs, the Ferrari hung on to its tyres better. "Hamilton was showing significant drop-off after 11 laps; Raikkonen was still going strong after 14. How this will play out on Sunday is a fascinating question." Ferrari technical boss James Allison admits it is "not realistic" for the team to think about beating the world champions to the title despite Sebastian Vettel's victory in the last race . 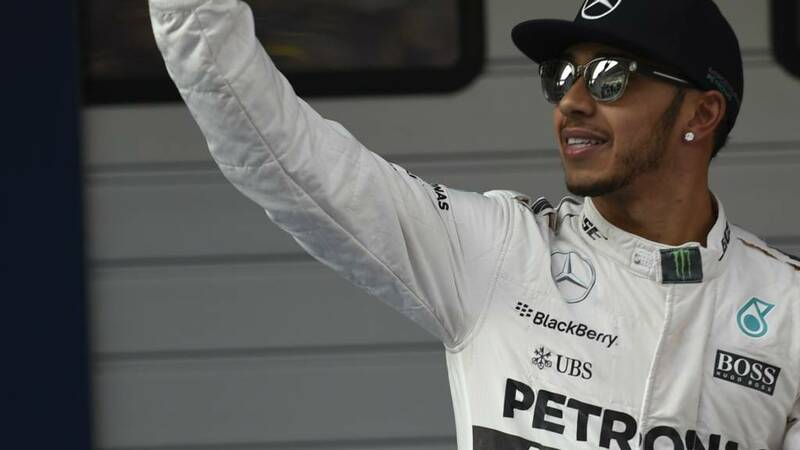 The German is three points behind championship leader Lewis Hamilton of Mercedes after two races. Allison said: "Mercedes have a bit more horsepower and a bit more downforce. Until we have closed those two gaps, it's not realistic to talk about title challenges." "Meanwhile, Red Bull look back in the game after a couple of bad races, and how long will it be before McLaren-Honda are up there, too? "Lots to look forward to - both this weekend and over the remaining 16 races." It's fair to say this ranks as one hell of a weekend for us sports fans, and what better way to kick it all off than with 20 cars having a good blat around the Shanghai International Circuit. In a few hours' time we should have a slightly clearer picture as to whether Ferrari's Malaysia win was just a wrinkle in Mercedes's season or a genuine threat to the world champions. Should be good viewing. Strap in.